The State Library of Victoria has some of one of the best information on the origins of Australian Rules, but sadly its internet page about the origins has been removed. It had links to Reports, Original Rules, Cigarette Cards, How to Kick and Exhibitions. According to Wikipedia, the origins of Australian Rules Football are obscure and the subject of much debate. While some of its early history may be obscure, the basis of its modern-day rules and clubs is well known (see below). The earliest accounts of "foot-ball" games date back to July 1829 and the earliest accounts of clubs formed to play football date to the late 1850s. On the Victorian goldfields, men from across the world brought their own ideas of football rules, and their games were played by a variety of rules. As these were mainly scratch matches (not a organised league or competition between different teams), this should not be considered as part of its forming history. a) originated from Irish games such as caid, an ancestor of Gaelic football. b) originated from English public school football games (rugby football). c) inspired by traditional indigenous Australian (marn grook). d) influenced by all of the above. Football was definitely inspired, and based on other ball games, with the first football identifiable Australian rules football game organised in Melbourne in 1858. Thomas Wentworth Wills, sometimes described as the game's inventor, was one of the umpires at a match between Scotch College and Melbourne Grammar School in the Richmond Paddock. Played as a 40 per side contest, the game is claimed by some as the first match of Australian football Wills had previously published letters calling for the formation of football clubs in a bid to keep cricketers fit during the winter months. Wills had attended Rugby school and played different types of football in England at a time when their rules were still in flux. The first known laws of the game were published by the Melbourne Football Club in 1859. Again, while there may be conjecture as to which games influenced Australian Rules, it does not diminish its known history that commenced with written rules, formation of clubs and its first gazetted games. The Melbourne Cricket Club (MCC) holds the original hand written rules drawn up by Wills and Co, however the Ballarat rules of 1862, held by the State Library of Victoria are not too dissimilar. In the early days few non playing participants would have known the rules, or had the ability and desire to umpire, hence it was often the football captains of each team that took on this duty. The rules were so often disputed that the "umpire" would, and could, carry the printed rules on their person, either in their back pocket or down their socks. Note: 1859 was the origin of Australian Football Rules (not the AFL - Australian Football League). However cricketer Tom Wills probably wanted to introduce Rugby School Rules and cousin Henry Harrison had only just learn't about football in 1858. Founders who put together the first rules on May 17, 1859 on which our Australian Football Rules are based were William Hammersley, Tom Smith, James Thompson and Tom Wills. In 1996 when the original of this exhibition was presented at the State Library of Victoria, there was much to celebrate. The Victorian Football Association (VFA - 1877) marked its one hundred and nineteenth year and it was the ninetieth year of the Australian National Football Council (ANFC-1906), which was formed to standardize the laws and co-ordinate the development of the game for all of the different leagues and divisions within Australia. 1996 was also the centenary of the Victorian Football League (VFL)/ Australian Football League (AFL). This 'the game of the people for the people', has been named various things over the last one hundred and thirty - eight years: Victorian rules and Australian rules, to name just two, from this point on it will be referred to as football. The game that began without rules, regulations and regulatory bodies has come to the point, some could argue, that the organisation running the game is bigger than the game itself. There is evidence and various theories that games of kicking and passing a ball in whatever form have long existed both in Australia and the rest of the world.2 We will begin however, at the commonly accepted s tarting point, the year 1858. 1858 is also the year that Tom Wills's letter was published in Bell's life in Victoria calling for an organized sport. Football was not a new form of entertainment, but up until this point written rules had not been necessary. Rules only become necessary when those playing a game have different perceptions on how the game is played. As clubs became established outsi de the Melbourne area they formed their own set of rules, however they would not have been too dissimilar to the Melbourne Football Club rules. May 8, 1866, football saw the first codification of it's rules by Harrison, Wills, Hammersley and Thompson at the Freemason's Hotel in Swanston Street, Melbourne. The rules have been changed, adapted and interpreted constantly from this point on. The scratch match that took place on Saturday 31 July 1858 would bear little resemblance to a football match played in 1996. There were around forty men to each side; it was played in a paddock with trees as goal posts; with no boundary lines or poin t posts; neither informal umpires nor written rules; the ball was round, made from a pigs bladder and encased in a leather skin. The game began at around one o'clock and was played until dark - finishing because the ball could not be seen anymore.11 The first to reach two goals was the winner. In 1869, the winner became the team with the highest score. Generally, a game would begin with a place kick. Ruckmen, as we know them, did not exist in the early years of football. In fact jumping for the ball after the umpire threw it into the air was forbidden. The ball was only thrown in to play when it w ent out of bounds. Rules of 1874 stipulated that the ball after leaving the umpire's hands must touch the ground before any player could again kick or touch the ball. It was permissible to push when a player was in rapid motion, whether or not he had the ball. He could only be held, not tackled if he did indeed have the ball. If the player was held, a scrummage would proceed. The goalposts were seven yards apart, but there were no point posts, as points did not yet exist. There were however 'kick-off' posts, which were twenty yards on either side of the goal posts. If the ball passed beside the goal within the 'kick-off' the defending side would kick the ball in from a distance of twenty yards inside these posts. After each goal the sides would chang e ends. Melbourne and Geelong are the oldest teams in the competition, being formed in 1858 and 1859 respectively. From this point on clubs and teams were formed all over Victoria and the rest of Australia. Towards the end of the 1896 season Carlton, Collingwood, Essendon, Fitzroy, Geelong, Melbourne, South Melbourne and St Kilda seceded from the Association and formed the Victorian Football League. These clubs were th e stronger clubs of the competition, they drew the biggest crowds and financially were the most successful. They complained that they were carrying the weaker and less popular clubs because they had to share the gate money.29 There was also the feeling that the VFA were not professional enough, an indication of which was the fact that the VFA was not taking advantage of the interest shown overseas and interstate. The Victorian Football Association (VFA) was formed in 1877. By 1896, there were 13 teams in the VFA Senior competition. Collingwood, South Melbourne, Essendon, Melbourne, Fitzroy, North Melbourne, Port Melbourne, Williamstown, St Kilda, Footscray, Geelong, Carlton and Richmond. 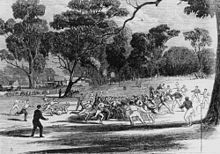 Geelong v South Melbourne played on 4 September 1886 is, arguably, the most important Aussie Rules game to be played in the 19th century. Although regular final games had not yet been instituted, the VFA arranged this game so as to determine the Premiers for 1886; both teams had gone through the season undefeated. The more things change, the more they stay the same. New clubs, powerful clubs and clubs merging and folding in the competion are not new; nor is players changing teams; ground rationalization; debates on game rules; player payments; entrance fees to the grounds; the main skills of the game changing and developing. By studying old newspapers, magazines, annual reports, private papers and photographs we can see the changes the sport has gone through, through it's long and varied history. Much has bee n written on the uniqueness of Australian football. What is it based on? Where was it first played? Why is it not really a 'national' sport? These questions are being asked and debated, for there is still much that is not known about this sport. But answers can be found and developed, if information is stored and held for future generations, as it is in the State Library of Victoria's many and varied collections. The league currently consists of 18 teams spread over five states of Australia. Many AFL teams date back to the beginnings Australian rules football, including the very first club, Melbourne Football Club. The Victorian Football League (VFL), started in 1897 with eight teams from the Victorian Football Association (VFA): Carlton, Collingwood, Essendon, Fitzroy, Geelong, Melbourne, South Melbourne, and St Kilda. Richmond and University entered in 1908, but University disbanded in 1915. In 1925, Footscray, Hawthorn and North Melbourne entered the competition. It remained in this 12-team single-state configuration until 1982 when South Melbourne relocated to Sydney and became the Sydney Swans. The next phase in 1987, introded the West Coast Eagles from Western Australia and the Brisbane Bears from Queensland. The league was renamed the Australian Football League in 1990 to reflect the expanded nature of the competition. South Australia was first represented in 1991 when the Adelaide Football Club joined the league. The Fremantle Football Club joined as the second WA team in 1995. After the 1996 season the Brisbane Bears merged with Fitzroy, creating the Brisbane Lions in 1996 and the Port Adelaide Football Club joined to maintain the league at 16 teams. In 2011, the Gold Coast Football Club joined the AFL, while Greater Western Sydney expanded the competition to 18 teams in 2012. The history of Australian football will soon be turned on its head if a series of recommendations to the AFL Commission is accepted - recommendations that will rewrite the official birth date of the Australian Football League. A working party chaired by commission chairman Mike Fitzpatrick has accepted that the origins of the AFL competition should be backdated about a quarter of a century, from 1897 to as early as 1870 - the year Melbourne won the first recorded premiership. In a move that would lift Carlton to the top of the premiership table on 22, ahead of Essendon on 20, the AFL is also expected to redefine the origins of the expanded national competition. Fitzroy would gain an extra flag , as would Collingwood, with the Magpies moving to 16. The radical revision would correctly establish Australian football as one of the oldest in international existence. The prevailing view is that the completion of the research should lead to sweeping historic changes and would be announced by Fitzpatrick at the 2015 Hall of Fame presentation. Although the VFL was officially renamed the AFL in 1990, history in future is expected to record that the Australian Football League truly began in 1987 - the year the Brisbane Bears and West Coast joined the competition. This is despite one consideration that AFL premierships should count from 1982 - the year South Melbourne relocated to Sydney. Under the working party's proposal, premierships will fall under various categories . For example, Melbourne, should the competition's starting point be dated back to 1870, will increase its premiership tally from 12 to 15 but will boast no AFL flags , rather 12 VFL flags and a further three from the previous era. Richmond will still boast 10 VFL flags but no AFL premierships, while Geelong's new total of 16 will equal Collingwood's but be broken up into seven VFA flags , six VFL and three AFL. Hawthorn, which did not exist as an elite club until the 20th century, will not see its total premiership tally change, but the Hawks will boast the most AFL premierships , with four of their 11 falling in the national era. Fitzpatrick is understood to have been close to announcing the historic changes at the 2014 Hall Of Fame function, but postponed the ratification pending more specific research into previously unrecorded club win-loss records and individual game and goal tallies. The AFL chairman referred briefly to the historians' work at the recent function, which recognised a group of the game's founding fathers. They will also further examine the true influence of Marn Grook and indigenous Australians on the AFL code. But it is known that a group of historians and researchers led by the AFL's Col Hutchinson and author and academic Mark Pennings have also been searching to cor- rectly credit some of the game's early champions with games previously not attributed to their records. These include Australian football Hall of Famers Charles Brownlow, Peter '' The Great' ' Burns, George Coulthard and Charlie Pannam. Brownlow's captaincy of a Geelong VFL premiership is not recognised in AFL records, while Burns, the game's first superstar , is credited with only 89 games for Geelong despite his extensive career in the VFA playing for South Melbourne. Coulthard, three times the champion of the colony, died of tuberculosis at the age of 27 and despite seven years and a premiership with Carlton in the VFA, his playing record, according the the AFL, has a '' NA' ' alongside it. Pannam's extensive VFA games for Collingwood are not recognised. While individual bragging rights could prove a focus in the rewriting of the AFL's historic narrative, the Fitzpatrick-chaired committee is understood to be determined that previously unallocated premierships be categorised according to their competitions at the time. The AFL Commission could also choose to backdate the birth of the competition, not to 1870 but to 1877 - the year the VFA was formed. This move was pushed strongly and publicly by Geelong in 2011 when its president Colin Carter presented the commission with a detailed submission to reclaim the game's '' lost years'' . In 1877, the VFA's founding, nine senior clubs made up the competition. Six of those - Carlton, Essendon, Geelong, North Melbourne (then known as Hotham), Melbourne and St Kilda - still underpin the AFL. Between 1877 and the formation of the VFL in 1896, Fitzroy, Richmond, Footscray and Collingwood joined the VFA. Carter, a former AFL commissioner, presented the AFL with a detailed submission requesting the commission reclaim '' 20 forgotten years of our football history'' , in a move ridiculed in some quarters as a push to credit the Cats with its seven VFA premierships from that era. But the commission took the Geelong submission on board and its argument through various historians that the VFA competition and Australian football origins deserved to be recognised as one of the world's oldest and most successful football codes. Supporting the revision is the relevant fact that in the 20 VFA years up until the VFL's formation in 1897, traditional AFL clubs recorded 76 of the total 80 top-four finishes . Among the wider implications for the game has been the challenge to research team lineups and scores from statistics seemingly no longer in existence. Friends of the Brisbane Ranges Inc.